This homemade lip balm is perfect for cold New England winters! I enjoy making my own beauty products at home – it’s fun and easy, and they make wonderful gifts, too. 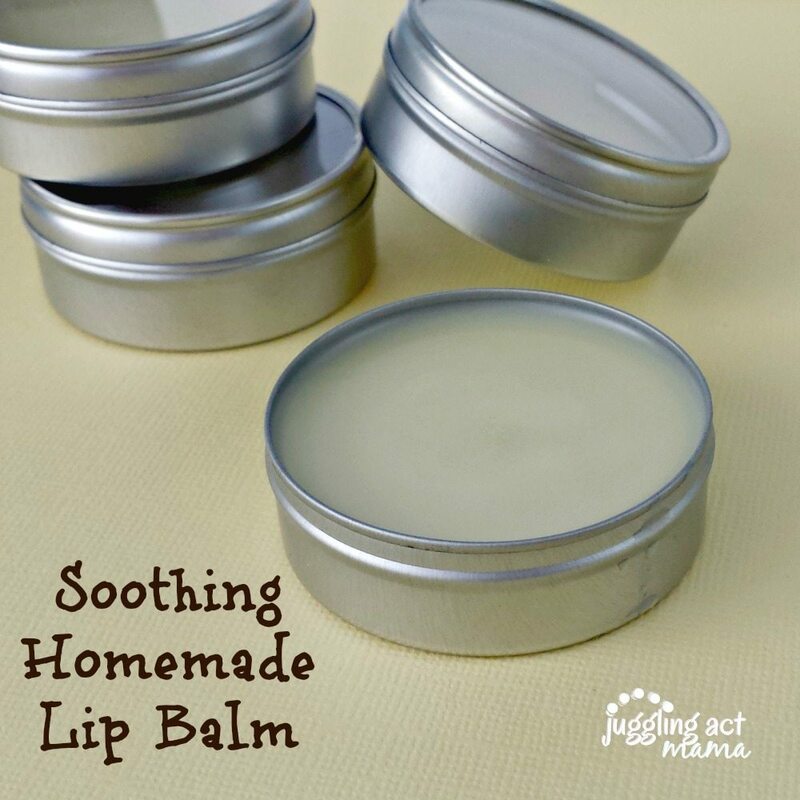 I’ve been wanting to experiment with making my own lip balm for awhile now, especially since my poor kiddos have such chapped lips all winter long. Speaking of kids, mine are are forever ruining my traditional lip balm tubes by twisting it up too high so it breaks, or putting the cap on and smashing it everywhere. I decided to use these little containers that I had purchased from Pick Your Plum earlier in the year. This homemade lip balm is light and smells like just a hint of honey. The warmth from your finger melts it a tiny bit, making it easy to swipe a little across your lips and it feels heavenly! Fill a small saucepan with about 3 inches of water and bring to a low simmer. 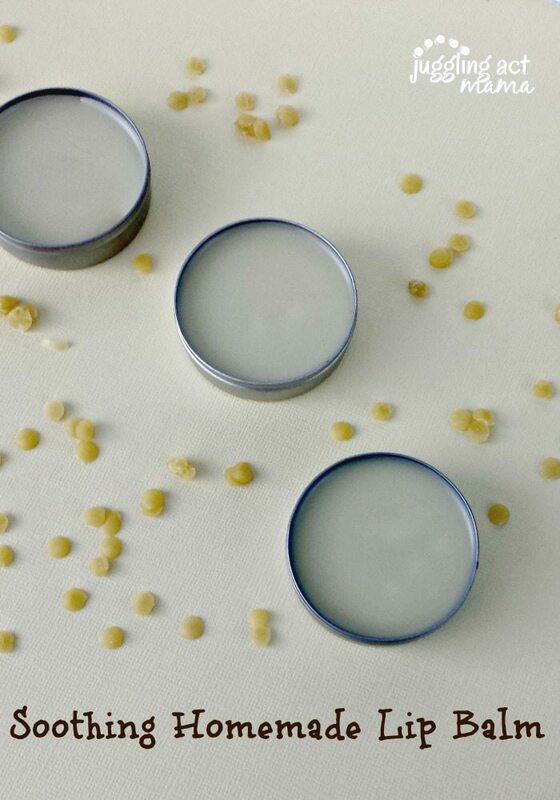 Place a glass bowl over the pot and add in the beeswax pellets, coconut oil and honey. Heat the ingredients for about 15 minutes, stirring occasionally while the pellets and oil melt and meld together with the honey. Remove the pot from the heat, but leave the bowl on top so the mixture doesn’t harden while you’re filling the tins. Use a dropper to carefully fill each tin. Do not handle the tins while the mixture is hot or you’ll burn your fingers. The balm with harden in about 5-6 minutes, but wait about 30 minutes for them to cool completely before handling. Makes approximately 5 tins 1-1/2″ tins. Download these super cute (if I do say so myself!) labels and gift away! One of these days when I have some money coming in, I want to try making all sorts of different stuff like this at home. My fiance would really like a homemade product like these as a surprise present I think. Thanks for the info. 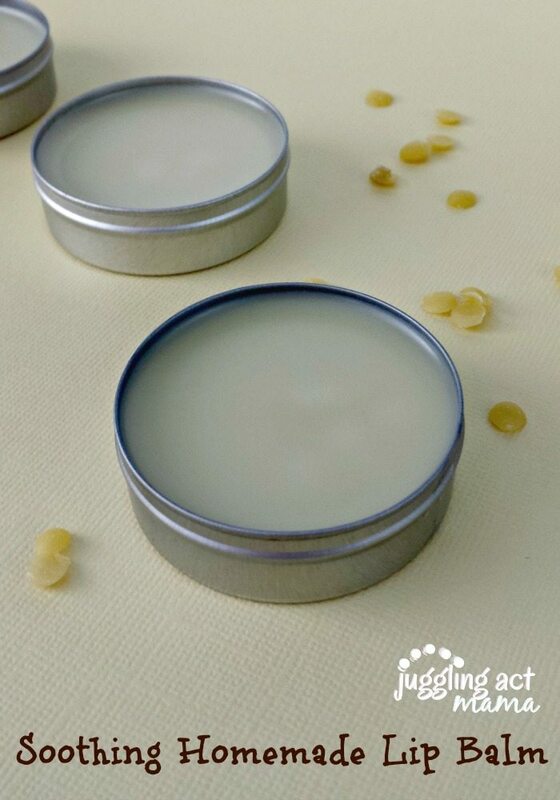 I love lip balm so am going to make this when I get the beeswax pellets. I love your Coffee Sugar Scrub! Made it for my daughter for her birthday and she loved it!! Made me some, too, it is great for hands!! I’m so glad you stopped by, Jocelyn! The lip balm really is so nice and light 🙂 Thanks for taking the time to comment! Is there another oil that can be used? I’m allergic to coconut oil but would LOVE to make my own. Hi Jodi, I’ve never tried it with anything but coconut oil. Sorry I can’t be more help! Pinned. I’m looking forward to trying this. Thanks for the tutorial! 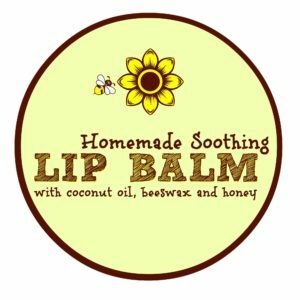 I made up a batch of the lip balm today but couldn’t get the honey to fully incorporate. Any ideas? It still feels great on. Trying the lotion bars next. These will make great additions to the girls’ gift baskets. Thanks! If I use those type tins, how many would you think this recipe makes? Hi Jennifer! If you use the 1-1/2 inch diameter tins, this recipe will make approximately 5 tins.